On Thursday 14th February, Underley Garden and Holly Trees completed a ‘love heart slip’. On this slip the young person wrote a compliment for either a peer or staff. These hearts were then posted in a post box and the compliments read out in the following days assembly. The pupils really enjoyed giving the compliments and also receiving them in assembly. What a lovely way to start a Friday!! 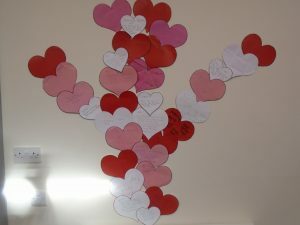 The love hearts have now been used to create a ‘Compliments Tree’ display to remind the pupils of the positive things people think about them.